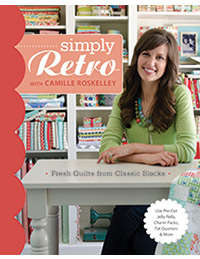 I’m excited to share another book review with you today: Simply Retro with Camille Roskelley – Fresh Quilts from Classic Blocks. 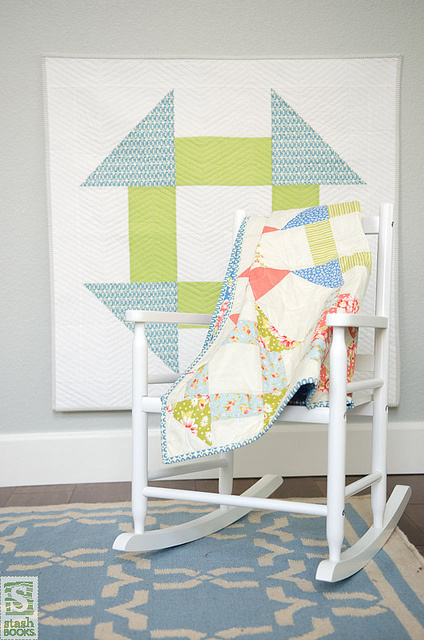 Building on the popularity of her amazing Swoon quilt, Camille has created 13 fabulous new quilts for this book, all based on traditional blocks with an updated twist. Most of these delectable delights can be made from precuts (a favorite “treat” we both agree on), but Camille includes instructions for cutting from yardage, too! In the book, Camille utilizes quick piecing methods such as chain piecing and she demos my favorite way of making HST’s (half-square triangles). She also scores bonus points from me for quilting a few of the quilts herself using Aurifil thread (my favorite). One of the really fun things about this book is seeing Camille’s sense of style and color come through. Although she is an amazing fabric designer, she uses a wide variety of prints in the quilts presented in this book. She combines fabrics from her stash with prints from her lines as well as those of other designers for the most wonderful fabric combinations. Dwell by Camille Roskelley. Aren’t the houses so sweet? I love Camille’s philosophy of “making it fit”. She will often make several different versions of the same quilt, but each one is unique in its own way. 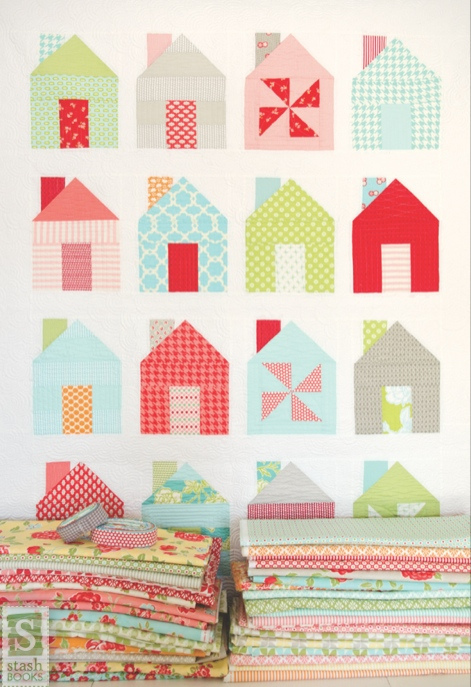 Sometimes she’ll change up the block size, quilt size, or add or subtract borders. 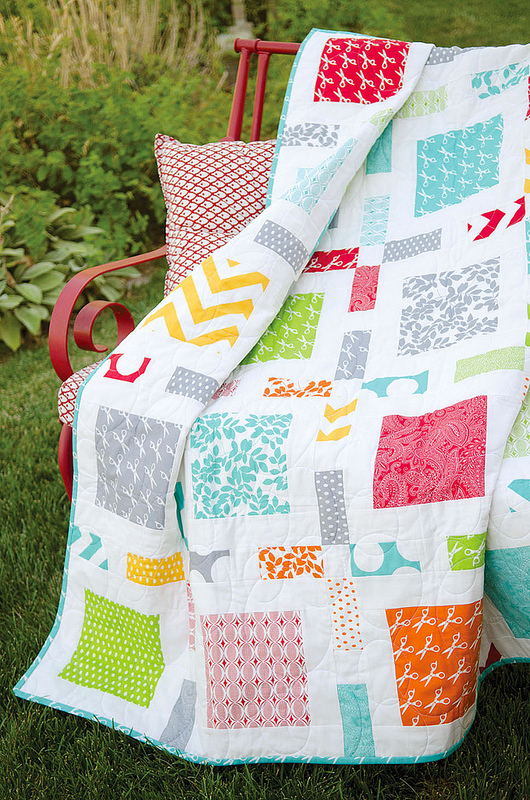 In Simply Retro, Camille walks you through the basics on how to adjust any quilt pattern to the size you want. She also includes steps on how to calculate quilt backings and bindings. Framed by Camille Roskelley. I love this one! Black Friday – Cyber Monday Starts Now – Everything’s On Sale! Love reading your detailed book reviews! Wow looks like a great book I like everything . Thanks for the great review! Her style is so fresh and clean!!!! Hugs……..
Sigh……..yup, Barnes/Noble’s earnings are up this year because of me, I’m sure!!!!!! LOL! It looks like a great book. I love those houses. As much as I enjoy buying fabric from you, i enjoy your Blog even more! Hoping Santa has this on his list for me! I’m liking everything you made. Sounds like my kind of book. Thanks for sharing.